Two boys from Assam have been selected to represent India in the men’s team to participate in the 8th Asia Pacific Tchoukball Championship to be held in Singapore fromJuly 6. 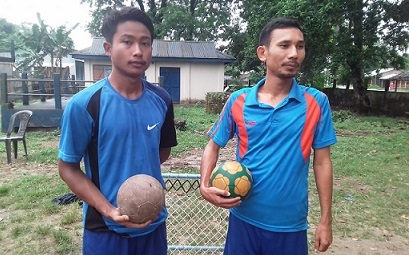 The two players are Ashok Goyary of New Amguri in Kokrajhar and Ankan Borah of Bokakhat of Golaghat district, who are members of the All Assam Tchoukball Association (AATBA). In the 8thAsia Pacific Tchoukball Championship to be held from July 6 to July 8, 2018 in Singapore, as many as 13 counties will be participating. The participation nations include Singapore, Malaysia, Philippines, Sri Lanka, Thailand, China, Hong Kong, India, Cambodia. The two youths have been included in the 15-member Indian team to represent the country in the championship. Ashok Goyary is the general secretary of the All Assam Tchoukball Association (AATBA). Goyary also said they would leave Assamon Wednesdayfor Singapore and expressed hope that they would be able to showcase best sporting talents in the Asia Pacific Championship. He also said that they would carry more than 20 Gamosas and Bodo traditional Aronnaiswith them to Singapore and present the same to the world Tchoukball players so that they would be able to know more about Assam. The Indian men’s Tchoukball team will take in the first match with China on July 6, 2018.